The Anniel Sport Company is a family based business located in Montebelluna, Italy. The business began in 1976 as a gymnastic shoe and apparel company. Anniel Sport quickly became popular for their cutting edge Italian design and unique way of constructing shoes using their own creativity and innovative ideas. 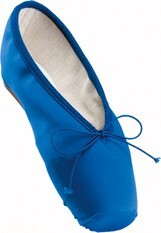 Anniel Sport now manufactures over 2500 different types of shoes for dance, gymnastics, athletics, and ballet. What makes this company really stand out is the pointe shoe color and fabric selection. 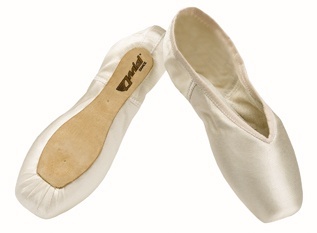 Many pointe shoe makers offer canvas and leather alternatives to the classic satin pointe shoe. 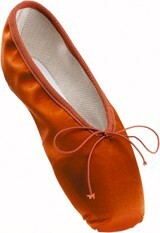 Anniel Sport can make pointe shoes in lycra, tulle, charmeuse, cotton, brushed cotton, and triacetate. Not only can a customer pick different fabrics, but the fabrics come in 21 different colors! The best feature of the Anniel Sport website is the fact that it is in English. No translation needed! To look through all of the color choices in their pointe shoe models you can visit their website here. This entry was posted in Italian Brands and tagged Anniel pointe shoes, Italian pointe shoes, Pointe Shoe Brands, Pointe Shoe Images, pointe shoes in 21 colors. Bookmark the permalink. Those Russian-style ones are quite lovely, too. There’s so many shoes we’re missing out on here in the U.S.! It does seem like Europe is a pointe shoe lover’s paradise. The fuschia pointe shoes are stunning and so very unique…….